Most occur because we do not educate ourselves, or our children about appropriate behaviour around dogs. Through our Paws for Safety program, we target lower primary school children with the aim of reducing the number of bite injuries, by teaching them appropriate ways of interacting safely with dogs. We look at the different jobs that dogs do for us, and have a question and answer time with prizes. Students get to practice the skills they have learnt with our accredited dog and handler on site. 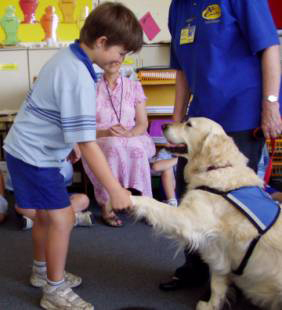 Research indicates that primary school children can be successfully taught how to behave safely around dogs provided there is commitment to the program and that teachers are provided with the resources and reference material for use after the classroom presentation. We provide an activity book for the teaching staff to follow up on the lessons learnt, as well as photographs from the session. The children are encouraged to draw or paint pictures of the dogs who have visited.